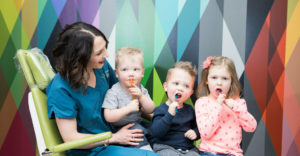 Behavior Guidance – Pediatric dentists receive training on how to encourage kids and guide their behavior. Techniques include changing the pitch or tone of the voice, positive reinforcement (tokens, toys, stickers, tattoos), and distraction (songs, TV shows, movies). One of the most helpful techniques is Tell-Show-Do. The dentist will prepare your child for each step of the visit by first explaining instruments, then showing them, and finally using them. These techniques help kids cope with an unfamiliar setting. Medical Conditions – Pediatric dentists receive additional training on common and less-common pediatric medical conditions. This prepares them to customize dental treatment to the needs of each unique patient. Many medical conditions can impact tooth formation, and the chronic use of some medications may increase the risk for cavities. It’s important for the dentist to understand how overall health is linked to oral health, and vice versa. Sedation / Operating Room – Pediatric dentists receive extensive training on the proper use of medications to help anxious children cope with dental care. Nitrous oxide (more commonly known as laughing gas) is one medication the dentist may use to help reduce nervousness and increase a child’s attention span. Oral medications may also be used to help make the dental experience more pleasant for fearful patients. Pediatric dentist can also treat children in an operating room. This is usually reserved for extensive cases, very young children, or those with a health concern. Dental Techniques – Board certified pediatric dentist must complete over 20 hours of continuing education every year. This helps them stay up-to-date on new techniques and materials. Guidelines and Recommendations: Pediatric dentists follow the dental guidelines set by the American Academy of Pediatric Dentistry. These guidelines are revised every year. Changes are made based upon research and/or clinical trials. These continuously updated guidelines ensure your child receives the very best care. So now you know, we’re not just small chairs and cute wallpaper (but the wallpaper is pretty amazing)!